The song playing in Alistair Peck's lab in the Fringe episode White Tulip is called Are "Friends" Electric? 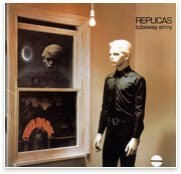 by Gary Numan & Tubeway Army on the album Replicas. For a complete list of all music used in Fringe, head over to the Fringepedia music page.